Last night as BC Bike Racers enjoyed a classic Powell River sunset an eagle flew overhead with a freshly caught salmon in its talons with two jet black ravens giving chase. Was it simply another Beautiful BC moment or a portent of things to come? Following the second stage in Cumberland, Geoff Kabush had a firm grip on the yellow jersey. However BCBR vets Sam Schultz and Cory Wallace, both with unfinished business from 2017, along with Frenchman Francois Bailley-Maitre and Quinn Moberg, had Kabush in their sights. After two days of rooty and rocky Vancouver Island tech singletrack, a little respite was in store as racers awoke at the beautiful Willingdon Beach campground to face a 52km course - no soul crushing climbs but plenty of loamy cross country trails and road spinning rests in between. Powell River has embraced the BC Bike Race with wide open arms since it became a regular stage back in 2010. 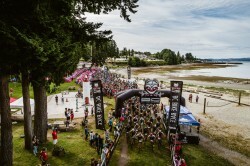 It shows in the enthusiastic Powell River citizens, some avid mountain bikers but many not, who show up to cheer racers, serve shots of virgin pina coladas at the now legendary Tiki Bar, or even dress up in a devil costume and shout "Welcome to the darkness!" as racers entered an underpass. It takes commitment to stay in devil character for six hours on course. Linda Diprose, treasurer for the Powell River Cycling Association, has been hosting the Tiki bar for five years and helped build the classic Aloha Trail that winds through lush ferns and red cedars, with its signature arched wooden bridge. "BCBR has given a tremendous boost to mountain biking in Powell River. Our trails have improved and we now have visitors who have done the race in the past coming back here to ride," Diprose said, as returning BCBR participant Jose Humberto Davila pedaled up for a shot of pineapple nectar. Davila, who made the trek to BC from his home in Saltillo, Mexico, was looking forward to this Tiki pit stop. "Why wouldn't I come back to the BC Bike Race? The people, the country, the trees, the mountains. It's amazing," said Davila, before hopping back onto the saddle. Diego Banfi, a sponsored Scott rider from Santiago, Chile, feels the same way. He heard about BCBR from fellow Chileans who participated in previous years and was inspired to register by their tales of epic singletrack. The trail, from loamy smoothness to rock drops and sinuous singletrack through coastal old growth forest, has exceeded his expectations. However he's equally impressed by the overwhelming support for mountain biking and the BCBR. Even after a helmet-cracking crash near the end of the Cumberland stage and three flats on the Powell River course, he's still smiling. They come out because in BC people love the sport of mountain biking and the community that it builds. Next up for Davila and his fellow competitors after the Tiki bar was cruisy Green Road, an old logging road traverse over to the day's feature trail Death Rattle, a freshly-buffed descent that received extra special attention prior to this year's event. From banked corners to filled root gaps and ruts, longtime course director Wayne Brewer, his son Russell and their trail building volunteers have been busy. In Powell River, building trail is a community effort. From the BOMB Squad, an informal group of retired loggers who love to sculpt artful bridges with their chainsaws, to the fat tire fanatics who belong to the Powell River Cycling Association, the trails of this remote Sunshine Coast town have a flavour all their own. Meanwhile at Squirrel Crossing, next to Aid Station 2 at Duck Lake, things were getting interesting among the leaders. Platt was in the sweet spot, feeling strong on Powell River's swift singletrack and had established a comfortable 80-second lead on followers Cory Wallace and Sam Schultz. Kabush was riding in 4th. Among the women, Clif Bar Katerina Nash remained in control, well ahead of teammate Hannah Finchamp and Giant Liv’s Kaysee Armstrong who were riding tire to tire at kilometre 35. It proved to be Platt's day. While a late push from Wallace and Schultz over the final 15km of rolling XC and gravel road narrowed the gap, it wasn't enough to challenge the German. Kabush retains the yellow jersey but Platt is looking forward to Day 4, that starts at Earl's Cove and finishes in Sechelt. Hump day is the mid-point in a seven day race, it marks the final count-down to the finish, a critical mental point for all participants. "I didn't really attack. I just pushed hard and nobody followed," Platt said. "I'm taking it day-by-day and just enjoying the ride." Dark clouds gathered, dumping rain over the coast, as racers dined at old Powell River's historic Dwight Hall. Skies were forecast to clear by the morning, promising tacky trails for Day 4.